Looking for more ways to serve their patrons, the Mexico Public Library is introducing a Friday delivery service. MEXICO — Looking for more ways to serve their patrons, the Mexico Public Library is introducing a Friday delivery service. She said someone with an active library card can receive books, DVDs, CDs, audio books and magazines delivered to their door. Deliveries will take place on Fridays between 10 a.m. and 3 p.m., except in bad weather. Requests for delivery need to be made before the library closes at 6 p.m. on Thursdays. Couch said to start this program, call the library at 364-3281. If you know of a particular author or genre that you prefer to read, you may request it. On the first visit, you will be requested to fill out a sign-up sheet. This will help for future visits. The librarian(s) will locate an item or two for you to consider. The items will be checked out on your card. If you look at an item and decide you don’t want it, it will be taken back to the library to be checked back in. Couch and assistant librarian Delaney Welch, who is working 10 hours per week and attending Central Maine Community College in Auburn, will wear delivery badges during the Friday detail. Couch added that if you don’t have an active card, one can be issued through the delivery service. Cards are for free for Mexico residents, $15 per year for out-of-town residents. “I’m hoping this effort to attract new patrons or people who just haven’t used their cards in years,” she said. Couch said postcards promoting the delivery service began a month ago. Some were also sent to a couple of area senior housing locations. The library is limiting deliveries within Mexico. If successful, the service will be expanded. Library hours are Wednesdays from 10 a.m. to 7 p.m., Thursdays from 10 a.m. to 6 p.m.; Fridays from 9 a.m. to 3 p.m., and Saturday from 9 a.m. to noon. 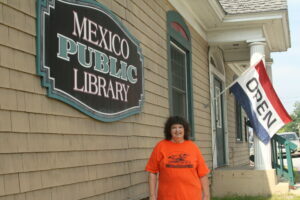 Mexico Library Director Marilla Couch is starting a delivery service for patrons.